I am in the process of an adoption. The details are, of course, not for public consumption, etc. But I am adopting through Foster Care. Obviously that has associated meaning. I spend much of my quiet moments thinking of how I am going to explain–especially to my son who remembers his first mother–what happened. Each of my daughters left the hospital with me. They don’t remember their first mother. 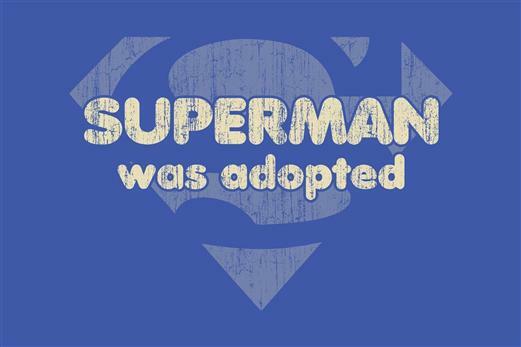 Regardless, there will be no lies about whether they were adopted or not. There couldn’t be even if that was my way, which it isn’t. There is no doubt in my mind that for my son that he needs to know the truth. Which is…that his first mother adores him. I will tell him that. I will tell him that she loved him so much it hurt and that she loves him still. I will tell him that what happened was a tragedy. I just don’t know how to say that in having her life fall apart all my dreams came true. This isn’t how I wanted to become a mother–with an associated tragedy. I am human enough to acknowledge that after temporarily mothering my son and daughters, I got to the point where I would rather have tragedy occur for her than for me. Is that sick? Disgusting? Real? I love them. I love them so much it hurts me physically to think of them not being with me. That’s just the truth of it. I think I’ll also tell them how much I love them when I tell them how much she loves them. That for me, they were miracles. 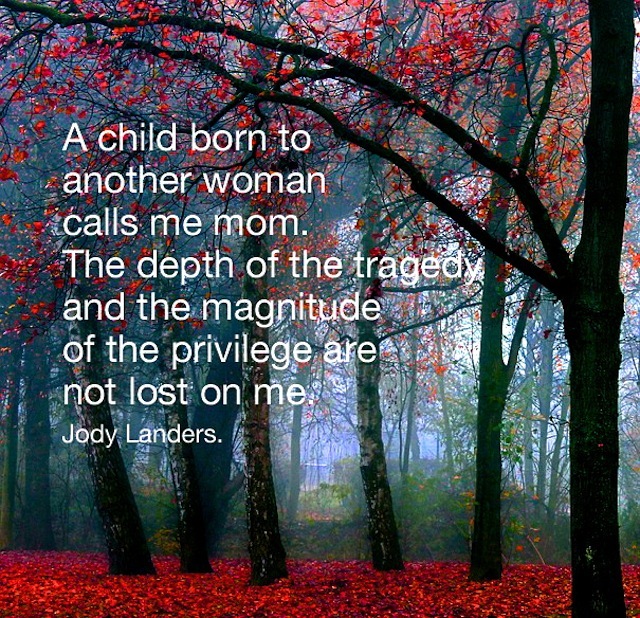 That each time they call me mother, I am honored and it has more power over me than any other word. I can’t do cry it out. My baby calls me when she wakes in the night, “Mama,” she says. And I answer, because I can not ignore that call and that name. Mama is magical, powerful and for me–miraculous. I imagine it hurts their first mother to not have them with her. Actually, I don’t have to imagine that. I know how wonderful these children are. So, I know that this time of joy for me has been a time of terrible pain for her. And I hate that. I hate it that she’s hurting. I hate it that you can’t have it both ways. I hate it that the time will come when each of my babies needs to know more about what happened and why. And that I’ll have to struggle to explain it in a way that helps them know that sometimes being love isn’t enough, but there is no question that they are loved. My children are 4, 5, and 6 of 7 adopted children among my siblings. I love that. That in my family being adopted isn’t unique. I love that these seven cousins have each other to talk to about their stories in a way that the biologically related cousins may not be able to understand. I think they might need that relationship as they age and mature. I’m so grateful that they’re the younger of the cousins. That if their older cousins struggle, they’ll have struggled first and be able to help my little ones. I know they will. For they’re miracles to our family and it is an honor to call them ours. But I will ensure, and this is my promise to their first mother, that they know their first mother (and of course their fathers) love them. I will make sure that my sweet, story-telling, snuggle bug of a son with an imagination as wide as the universe will be able to envision a woman who looks a little like him–out there in this big world–loving him so much it hurts. And I will ensure that for each of my daughters when their times arrives. So, I know this isn’t a happy mother’s day for you, dear first mother of my children, but I hope it helps to know that when we talk about you, we talk about you in a way that makes sure they know you love them. And that when other questions happen, they’ll get the truth. That what happened isn’t fair. That life isn’t fair. That they’re a miracle to all of us because their very existence is beautiful. And that so many people love them, it hurts. Amanda, this is really lovely. What a tribute to the women who mother the child of another, and to the women who give that privilege to one who desperately wants it. Thank you for sharing. I reposted it to my own blog so that more women can think about the meaningful ways we mother others. Thank you! Thx Gretchen! Feel free to share however you wish.